If you run a print shop and you’re still relying on traditional business practices to do everything from marketing your services, taking customer orders, preparing, proofing, (perhaps repeating a few steps if the customer changes their mind about something or didn’t explain their request properly in the first place), printing, finishing, packing and shipping, you know that it takes time, effort, skill and experience to get everything just right – and you want to get it just right. You take a pride in your work and you don’t want to compromise on quality. You may think that using design online software to handle any part of your highly skilled job will inevitably result in a lowering of standards. Well, that’s fine, but the trouble is that your competitors are already using online design software and they’re attracting customers that might have been yours if you were willing to give the new technology a chance. In any case, online design software is all about giving the customer the opportunity to specify exactly what they want, right from the start of the process, so how can that be a bad thing? Modern business is always on, always accessible, always responsive. If your business is none of these things outside of store opening hours, then your customers will go elsewhere. Whatever type of printing you specialize in, when a potential customer has closed their own store or office for the day, made it home, had dinner and seen the kids to bed – whenever it happens to be in their day that they finally grab a few peaceful moments to work on that flyer, or banner, or promotional t-shirt, or whatever else they have in mind, well, that’s the moment that, browsing online, they’ll find a print shop with a modern web presence, including a fantastic, user friendly tool that lets the customer design their own layout, upload their logo, add some decorative elements, put it all together and tweak it until it perfectly suits their requirements before submitting the order and going to bed. Whichever print shop owns that website will have just gained a customer. Shouldn’t it be yours? The fact is that there are already plenty of printers out there who are offering online design software as standard. Whether or not that potential customer, sitting at home at the end of a long day and deciding that, finally, away from the noise and interruptions of the office, they can think about that printing project, is aware of this yet isn’t even relevant. The customer may not be specifically looking for print shops that will allow them to design and confirm their order online. They may simply be looking for a print shop so that, if they can find a spare half an hour during opening hours, they can phone up to discuss their needs and maybe take their logo artwork to the shop, or ask if it’s possible to email it. And, if you have a website at all and if you have put a lot of effort into optimizing it for search engines and all the other aspects of online marketing, then they may find you. So why does it matter whether or not you can offer an online design service? Well, if they only look at your website, for some reason and if they don’t notice any of the search results that will mention online design, then maybe they will email your or make a note of your phone number and you will get their business. But why wouldn’t they check a few other printers to compare prices and terms? Why wouldn’t they notice that some other printers have a new system that will allow them to put their design together online, using the image files that they already have. Why, once they do notice this, wouldn’t they click through to one of these web sites to try the system out? And, having done this, why on earth would they abandon the idea and go back to a printer who couldn’t offer them this service? The thing is, design online software is fun to use. For a printer who works with graphic design elements every day, this may be a frustrating thing to hear. After all, with your experience, you could probably balance the customer’s text, logo or whatever they have in mind in a far more pleasing way. You’ve seen thousands of poster designs pass through your hands and you know what font size will work best, just as you know when too many images will make a flier look cluttered. You know what colors work together and which will just clash…the list probably goes on and on. The thing is, though, that doesn’t make any difference to someone who’s just spent an entertaining quarter of an hour trying out all the different font sizes and colors and fitting everything together with their images. They’re happy with what they’ve achieved and they’re happy that someone has provided them with the software to do it. The printer whose website the customer has been using can switch on the shop computer the next morning and have a design ready to work with. That printer could also probably have put together a better version of the customer’s design but, and this is the thing to remember – he didn’t have to. The time which he would have spent on that task has been freed up and he can get on with other work. Depending on how the printer has chosen to set up his system, even tasks such as proofing, work scheduling and invoicing can be automated, saving even more time. Since the customer has saved their designs to a secure area on the printer’s system, they can easily log in again in future for repeat print runs, or to use their existing designs as the basis for an entirely new item. A small business that sponsors an annual charity event can keep their designs safe from one year to the next, simply logging in to change the date on t-shirts, fliers, posters etc. before confirming the order. The convenience of this system for the customer makes it unlikely that they will take their business elsewhere in future. 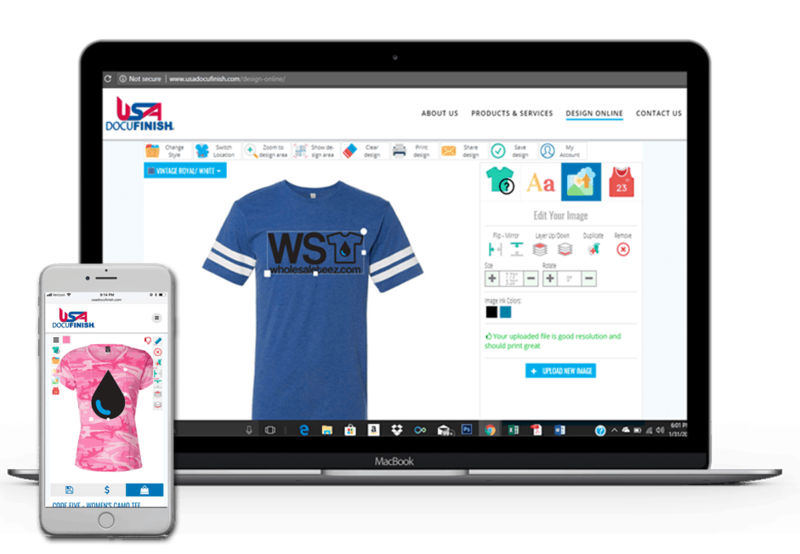 For the print shop, the benefits are obvious – even new orders are already prepared for printing – the online design software has taken care of that. If there are any queries about a design, then any member of staff with log in authority can easily check it out and resolve them. Repeat orders can go straight to print and time is saved at every stage of the process. Good web to print design online software, such as that supplied byWeb2ink, has been created by people who not only understand how software works but also how the print industry works. You may not think that a customer has created the most attractive design but, guided by the software, they will have created a printable design. The software won’t let them make design choices that fall outside the realms of what is possible for you to print, so you don’t have to spend hours correcting bad artwork or explaining the limitations of the printable area. You may wonder whether people will just play with the design system and never get around to placing an order. Well, this may be true in some cases – after all, some members of the public might decide to have a go at using online t-shirt designer software, only to realize that they truly don’t have any aptitude for design. Conversely, other people may try out the software just to see how it works, find that they’ve created something they like and then decide to place an order after all. People who’ve enjoyed the process of creating a design and have ended up with something they feel proud of are invested in that design and are more likely to complete an order than someone who is merely browsing through pages of ready made goods. In any case, it will make no difference to you if someone uses the design tool to create a design that they ultimately abandon. A customer who walks into your traditional store, spends a lot of time going over their requirements, discussing their options, pricing, lead time etc. then, just as you think they’re going to place an order they change their mind and leave, has taken up a lot of your time for no return. With an online customer, even if they’ve spent the whole night trying out every possible design they can think of, none of it has taken any of your time so, if they never actually place an order, you lose nothing. One huge advantage of custom design online software is the flexibility it gives customers. They can save their designs to give them the chance to decide if they still like them when they come back and look again. They can give other people access to their designs, so that they can collaborate and share them before deciding to buy. This is especially useful for organizations wishing to have everybody’s buy-in before approving a new promotional poster or team shirt, for example. It’s also great for informal groups – friends who want a quirky way to celebrate graduation might order t-shirts with a group design and individual names – easy to do with the Web2ink design software. Since the customer can choose from your full range of printable goods, another person might come to the site intending to order a banner for a celebration, then realize that it would be fun to have themed place cards, menus, maybe even mugs or whatever other base products you have in your range. This is just one of the ways in which adding an online design tool to your web presence can dramatically improve sales. It’s true that many of these sales may be small orders, individually. You’d probably rather take a run of 50 aprons for a take away chain than a handful of t-shirts for a bunch of high school graduates, each one needing a different name. Well, that’s fair enough but, with the design and order management software included in a Web2ink eCommerce website, much of the work involved in setting up these small orders has been taken care of for you. What’s more, these orders are likely to proliferate as the graduates’ other friends see their t-shirts and want to do the same thing. If you are completely new to the idea of selling online then, when you get your new eCommerce website with design online software capabilities, you should probably get some advice on how to market it successfully. All businesses must be prepared to put time and effort into making the most of their online presence and the print industry is no different. When customers try out your fantastic new online design system they will love it, but they need to be able to find it, or they will never get that chance. As well as building your website for you, Web2ink offer a range of flexible, scalable marketing plans, to help you carve out your territory in the online world. You will need to be aware that this does not happen overnight. In a competitive industry, those top slots in the search engine rankings are prizes that must be worked for. Web2ink can help you do this with the right mixture of search engine optimization – both general and specific to the local area, building relevant and useful links with other websites, keeping your site up to date and growing, with regular additions of fresh, engaging content and developing your social media presence, so that users of this hugely important part of the online world can easily find and ‘follow’ you. If you are thinking about using online design software, then web2ink.com is a good place to start. We can offer you not only the software platform, with regular updates and lifetime customer service, but also our expertise in the area of modern, ethical web marketing for print companies. Whatever option you choose, we’d like to wish you every success for the future. © 2019 Web2Ink. Time to compete with the big boys.